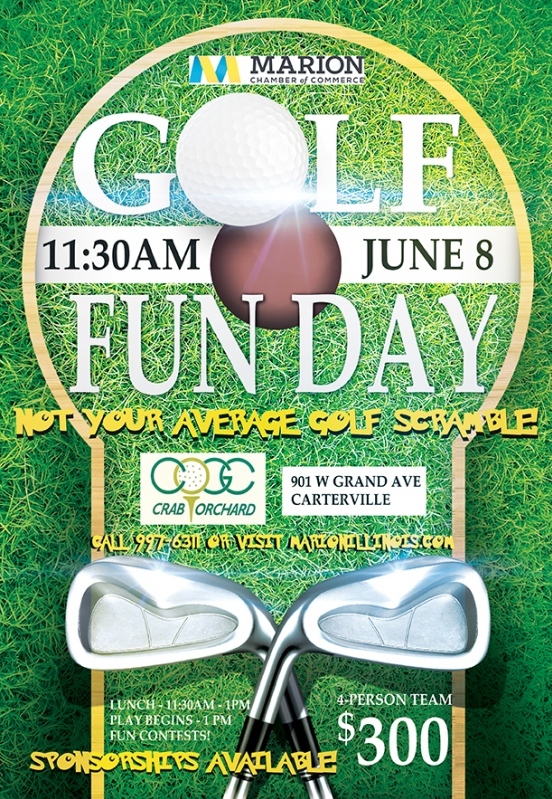 This event is NOT your average golf scramble! 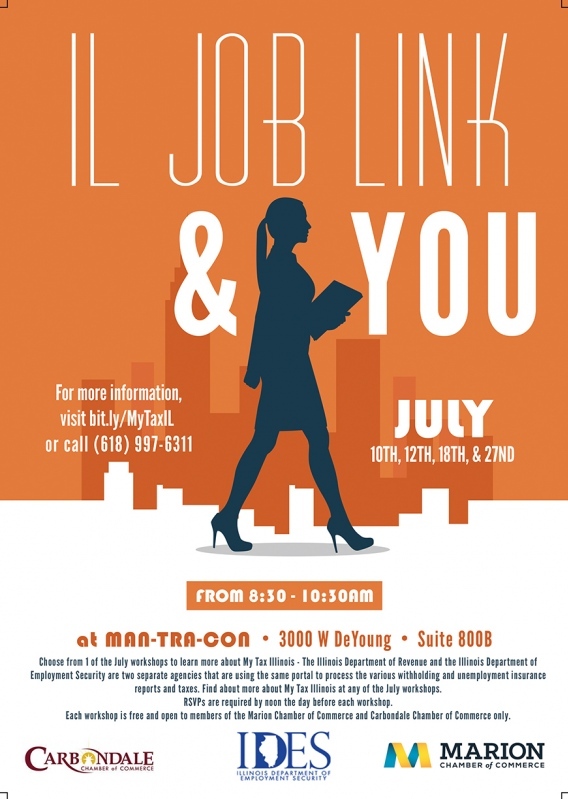 The Illinois Job Link Workshop will be held on June 5, 7, 20 and 22 from 8:30-10:30 a.m. 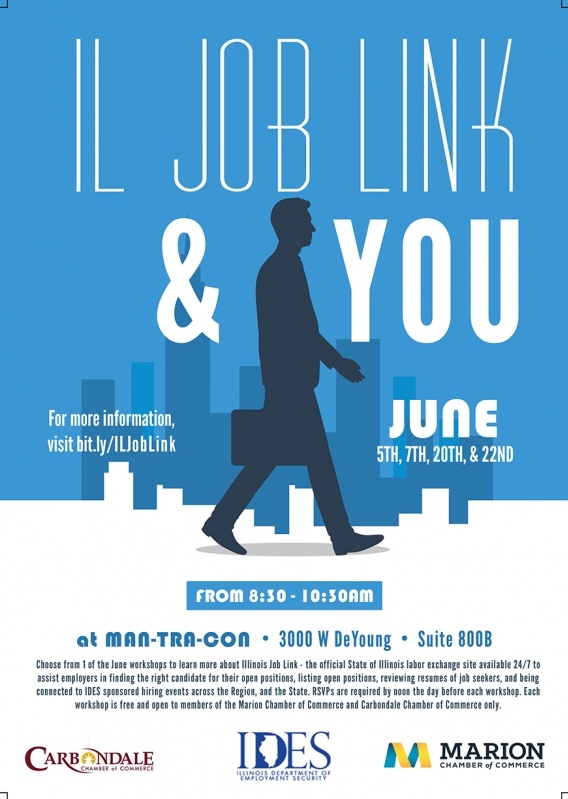 Choose from 1 of the June workshops to learn more about Illinois Job Link - the official State of Illinois labor exchange site available 24/7 to assist employers in finding the right candidate for their open positions, listing open positions, reviewing resumes of job seekers, and being connected to IDES sponsored hiring events across the Region, and the State. 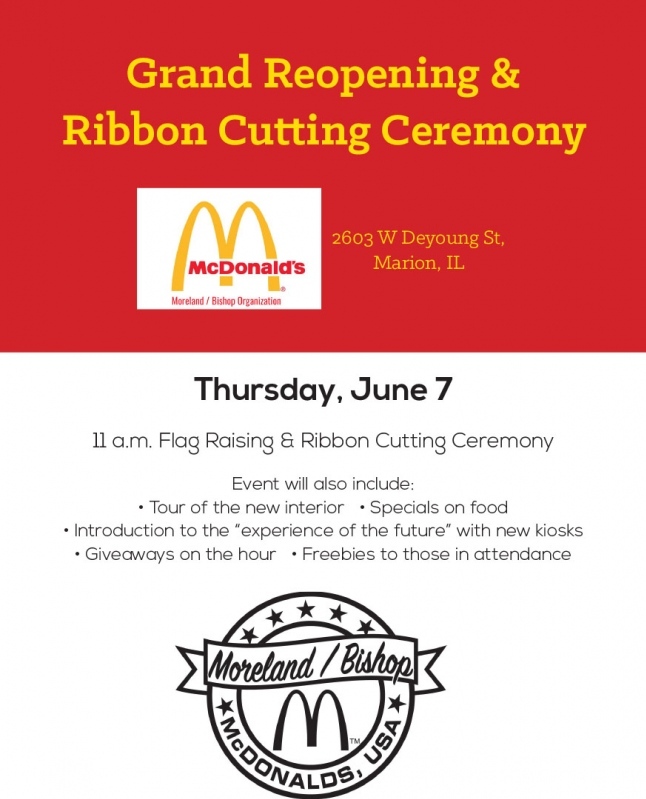 A Grand Re-opening & Ribbon Cutting Ceremony will be held on Thursday, June 7, starting at 11 a.m. for McDonalds, 2603 West Deyoung Street, Marion. 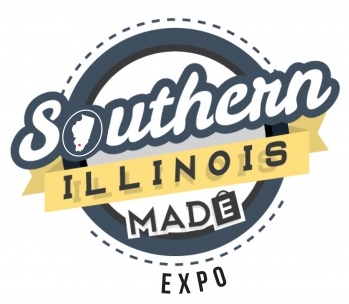 The event will include an 11 a.m. flag raising and ribbon cutting ceremony and a tour of the new interior, specials on food, introduction of the "experience of the future" with new kiosks, giveaways on the hour and freebies to those in attendance. 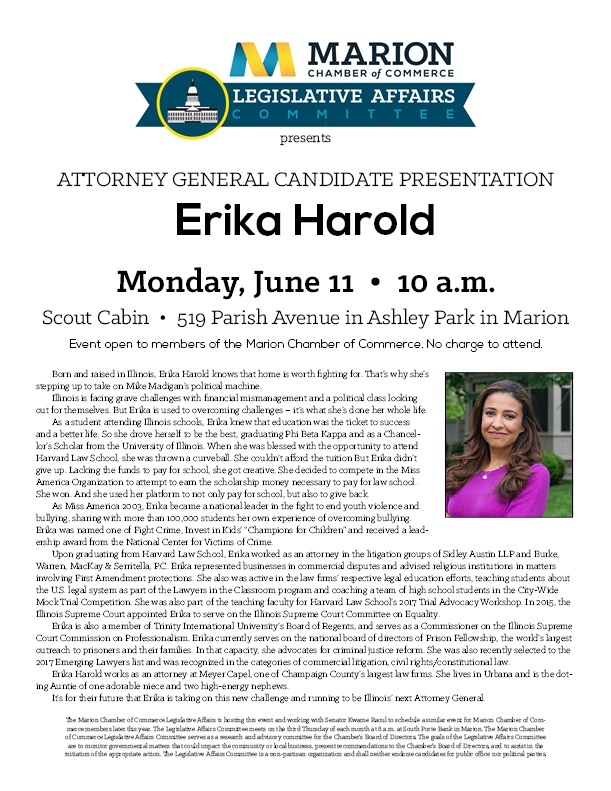 The Marion Chamber of Commerce Legislative Affairs Committee will host an Attorney General Candidate Presentation with Erika Harold on Monday, June 11 at 10 a.m. at the Scout Cabin, 519 Parish Avenue in Ashley Park in Marion. 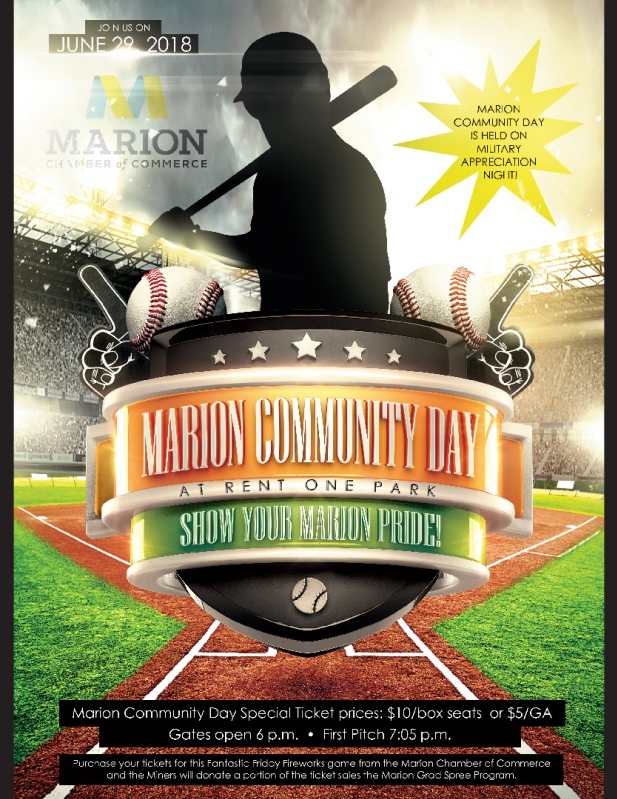 The event is open to members of the Marion Chamber of Commerce. There is no charge to attend. Illinois is facing grave challenges with financial mismanagement and a political class looking out for themselves. But Erika is used to overcoming challenges – it’s what she’s done her whole life. As a student attending Illinois schools, Erika knew that education was the ticket to success and a better life. So she drove herself to be the best, graduating Phi Beta Kappa and as a Chancellor’s Scholar from the University of Illinois. When she was blessed with the opportunity to attend Harvard Law School, she was thrown a curveball. She couldn’t afford the tuition But Erika didn’t give up. Lacking the funds to pay for school, she got creative. She decided to compete in the Miss America Organization to attempt to earn the scholarship money necessary to pay for law school. She won. And she used her platform to not only pay for school, but also to give back. Upon graduating from Harvard Law School, Erika worked as an attorney in the litigation groups of Sidley Austin LLP and Burke, Warren, MacKay & Serritella, P.C. Erika represented businesses in commercial disputes and advised religious institutions in matters involving First Amendment protections. She also was active in the law firms’ respective legal education efforts, teaching students about the U.S. legal system as part of the Lawyers in the Classroom program and coaching a team of high school students in the City-Wide Mock Trial Competition. She was also part of the teaching faculty for Harvard Law School’s 2017 Trial Advocacy Workshop. In 2015, the Illinois Supreme Court appointed Erika to serve on the Illinois Supreme Court Committee on Equality. Erika is also a member of Trinity International University’s Board of Regents, and serves as a Commissioner on the Illinois Supreme Court Commission on Professionalism. Erika currently serves on the national board of directors of Prison Fellowship, the world’s largest outreach to prisoners and their families. In that capacity, she advocates for criminal justice reform. She was also recently selected to the 2017 Emerging Lawyers list and was recognized in the categories of commercial litigation, civil rights/constitutional law. 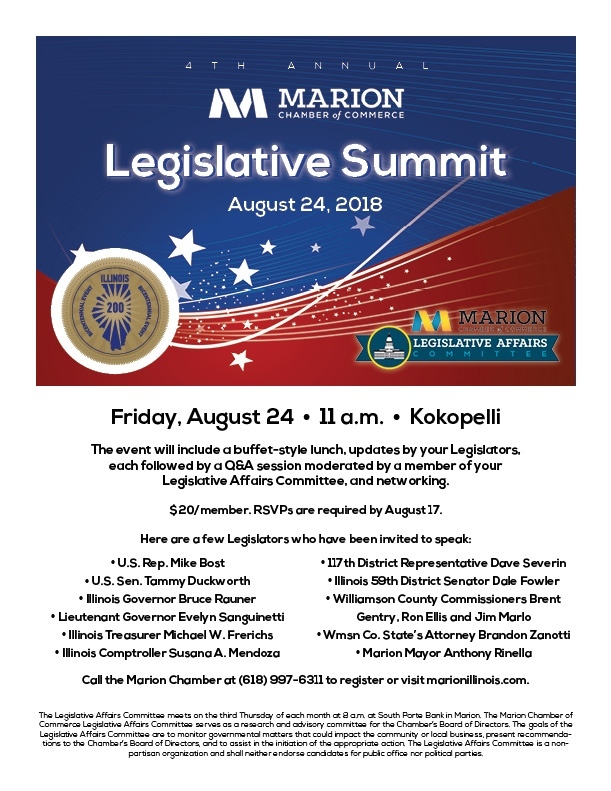 The Marion Chamber of Commerce Legislative Affairs is hosting this event and working with Senator Kwame Raoul to schedule a similar event for Marion Chamber of Commerce members later this year. The Legislative Affairs Committee meets on the third Thursday of each month at 8 a.m. at South Porte Bank in Marion. The Marion Chamber of Commerce Legislative Affairs Committee serves as a research and advisory committee for the Chamber’s Board of Directors. The goals of the Legislative Affairs Committee are to monitor governmental matters that could impact the community or local business, present recommendations to the Chamber’s Board of Directors, and to assist in the initiation of the appropriate action. The Legislative Affairs Committee is a non-partisan organization and shall neither endorse candidates for public office nor political parties. 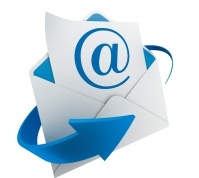 NOTE: RSVPs are now due by Friday, June 8 at noon! Registration is limited to the first 130 guests. 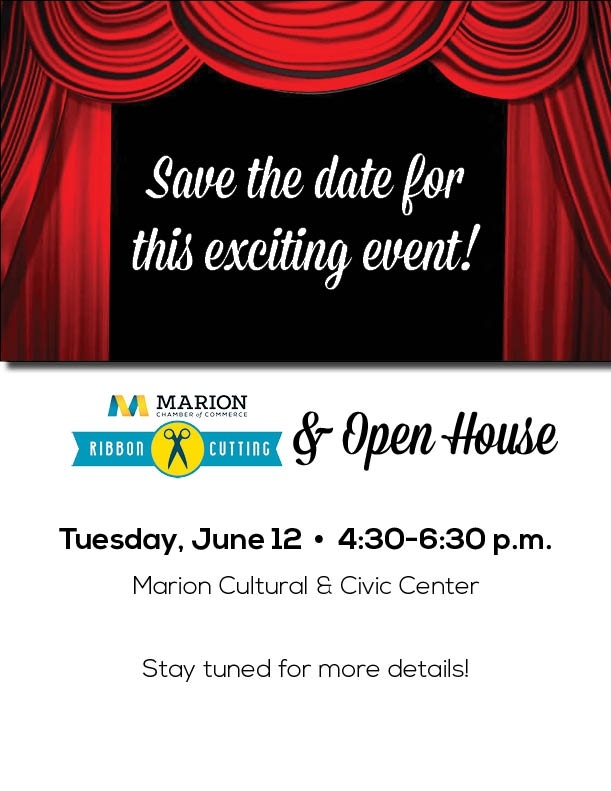 The Marion Chamber of Commerce Monthly Membership Luncheon will be held on Tuesday, June 12 at The Pavilion. Lunch service begins at 11:45 a.m. The speaker will be 2018 Grad Spree Scholarship Winner Bradley Marks and 2018 John A. Logan Two-Year Tuition Waiver Winner Karlee Webb. Small's will be the caterer. 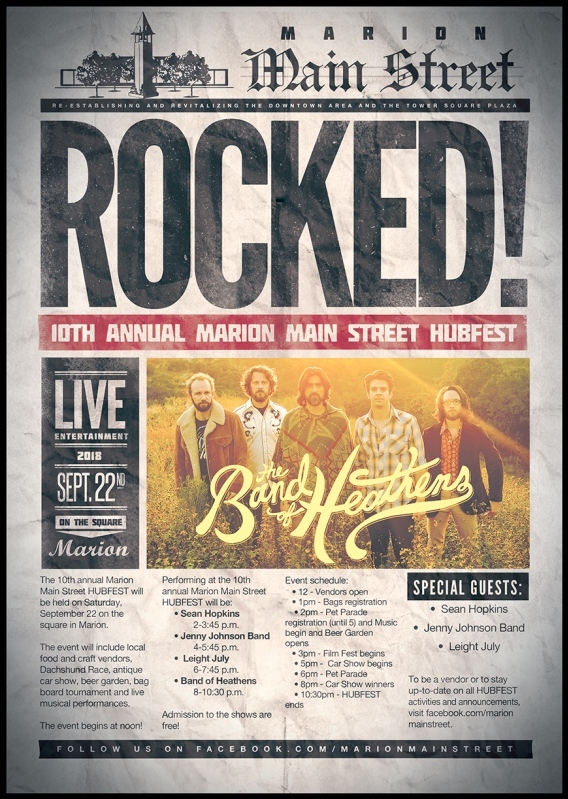 The menu will include meatloaf, mashed potatoes, green beans, lettuce salad, and ooey gooey butter cake. Integrated Health of Southern Illinois the sponsor of the June Monthly Membership Luncheon. Wednesday, June 13, 2018 | 11:30 a.m. – 1:00 p.m. 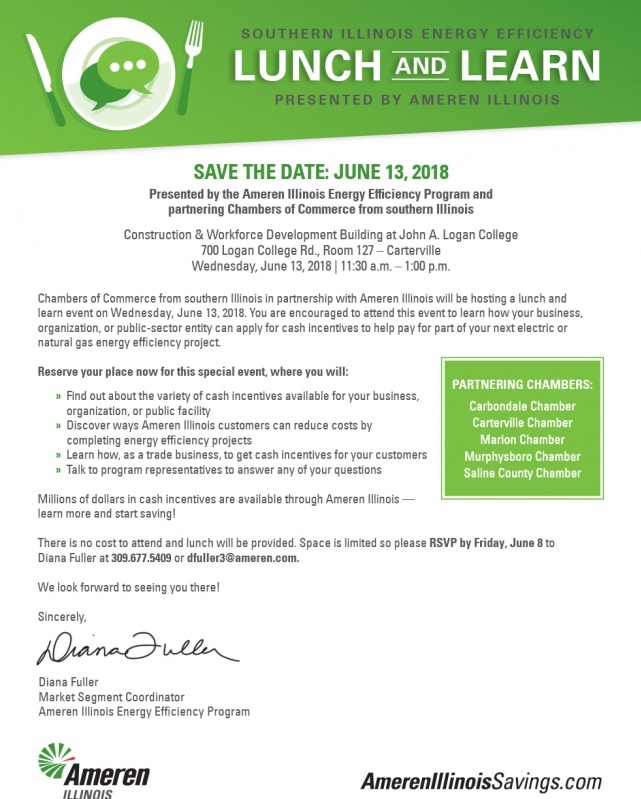 Chambers of Commerce from southern Illinois in partnership with Ameren Illinois will be hosting a lunch and learn event on Wednesday, June 13, 2018. You are encouraged to attend this event to learn how your business, organization, or public-sector entity can apply for cash incentives to help pay for part of your next electric or natural gas energy efficiency project. Millions of dollars in cash incentives are available through Ameren Illinois — learn more and start saving! There is no cost to attend and lunch will be provided. Space is limited so please RSVP by Friday, June 8 to Diana Fuller at 309.677.5409 or dfuller3@ameren.com. 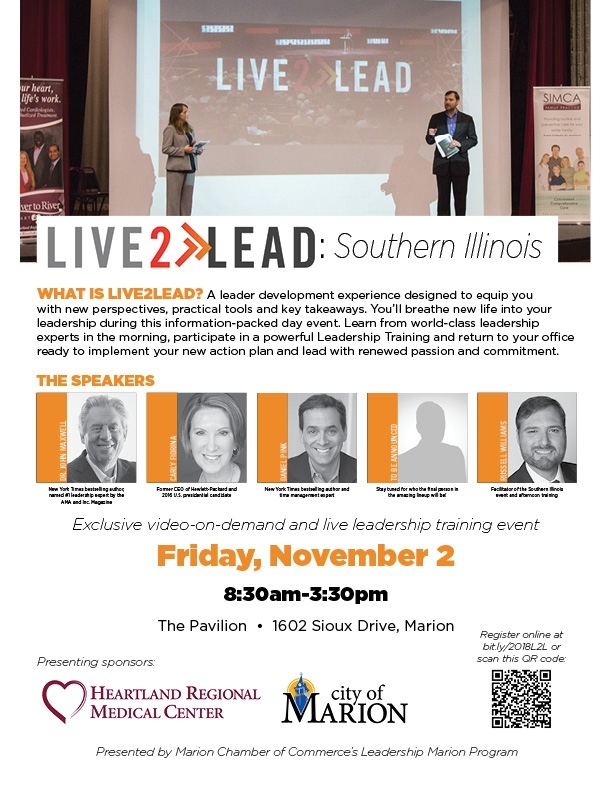 Want a FUN way to network with business leaders, coworkers, clients? 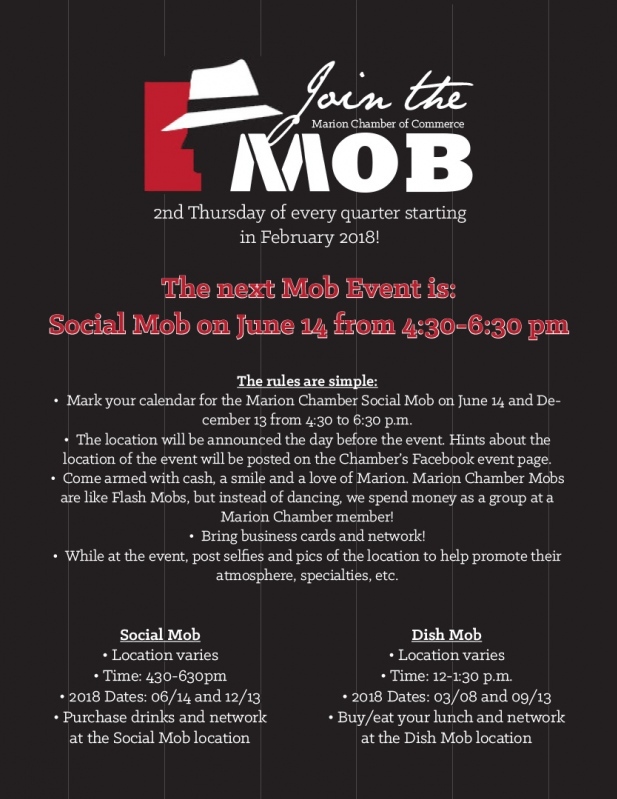 Join the Marion Chamber Social Mob on June 14 from 4:30-6:30 p.m. at a Marion establishment! There will be several drink specials at the venue.